When we see a bird flying from branch to branch happily chirping, it is easy to imagine they lead a simple life of freedom, flight, and feathers. What we don’t see is the arduous, life-threatening challenges they face at every moment. In Beaks, Bones, and Bird Songs, ornithologist Roger Lederer guides the reader through the myriad, and often almost miraculous, things that birds do every day to merely stay alive. Like the goldfinch, who manages extreme weather changes by doubling the density of their plumage in winter. Or urban birds who navigate traffic through a keen understanding of posted speed limits. 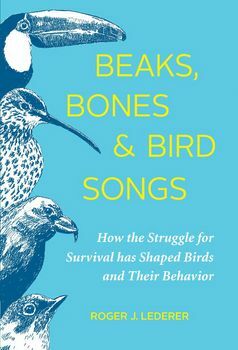 In engaging and accessible prose, Lederer shares how and why birds use their sensory abilities to see ultraviolet, find food without seeing it, fly thousands of miles without stopping, change their songs in noisy cities, navigate by smell, and much more. Roger Lederer has studied bird behaviour for more than thirty years. In Beaks, Bones, and Bird Songs he shares this knowledge in an entertaining and eye-opening way that will be widely embraced by birders and nature lovers. An engaging, informative narrative that explores how and why bird behaviour is continually evolving.